The Gowanus Lounge: Testing for Toxics Under Gowanus Playground? 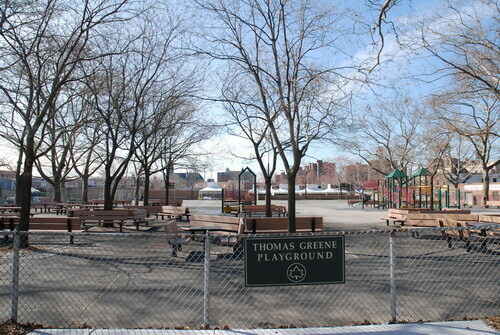 We have reported a couple of times about the potentially toxic threat under the Thomas Greene Playground in Gowanus. Located at Third Avenue and Douglass Streets, the park sits atop the former site of a Manufactured Gas Plant (MGPs) of the Fulton Municipal Gas Company. The plant operated from 1879 to 1943. MGPs are notorious for leaving behind an underground toxic stew. (You can read our earlier story here.) The Public Place site in Gowanus, for instance, is the site of a former MGP. In any case, the park has been proposed as the site of a new skate park and, now, some officials are saying that testing for toxics is in order. In fact, Craig Hammerman, District Manager for Community Board 6, told the Brooklyn Paper, "It would be foolhardy for the city to spend public money on a park only to have to come back some time later for a cleanup." Various consultants' studies and EPA testing have found that there are toxics sitting beneath the site, which is in keeping with the highly toxic legacy of MGPs. The Parks Department apparently says that toxins are too far underground to cause any threat. The main toxic leftover of MGPs is coal tar. It can migrate thousands of feet underground on the water table over time. Interestingly, nearby properties have recently been purchased for residential development in advance of a hoped-for Gowanus rezoning.